The attitudes of the youngest generation to enter the workforce reflect a profound sociological shift. 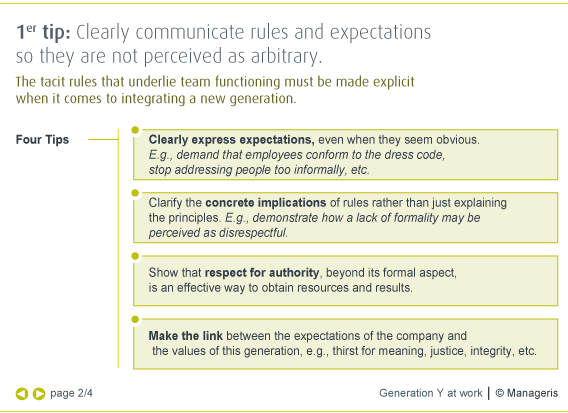 Understanding this generation better is essential to work with younger employees more effectively. ¬ Generation Z: What to expect? 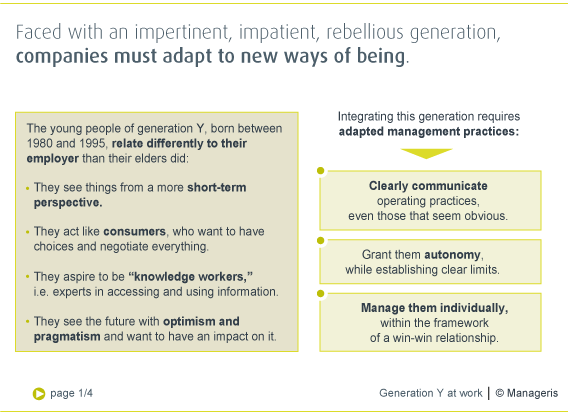 The arrival of a new generation in a company invariably triggers friction with preceding generations already in place. To quote Socrates, “Our youth makes fun of authority and has no respect for its elders. Children today do not stand when an elderly person enters the room. They talk back to their parents; they are tyrants…” Rudeness, impatience, resistance to the rules; managers are used to being confronted with young people who are just entering the labor market and who need time to make the transition to becoming effective members of the team. Yet, the integration of the most recent wave of young workers, termed “Generation Y,” born between 1980 and 1995, leaves many managers and executives perplexed. And for good reason: These newcomers grew up in an era of significant social and technological shifts that profoundly impacted their way of understanding how human beings relate to one another. The authors of the analyzed publications consequently emphasize that managers must do much more than simply help these young people make the transition into the adult world. At a more profound level, the latter are and will remain fundamentally different from their elders. The challenge is thus to also adapt management methods to interact effectively with young employees characterized by new ways of being at work. – Stop believing that the implicit rules you take for granted are self-evident to everyone. Make them very clear to your youngest employees. – Satisfy their desire for autonomy and responsibility by specifying how much leeway they have. 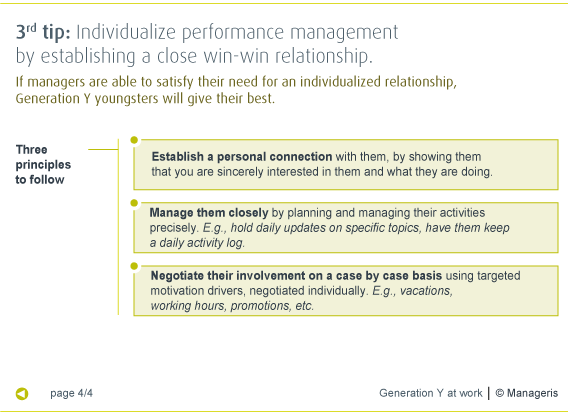 – Manage their day-to-day performance, by making short-term win-win agreements with them. Some advice to manage the youngest wave of employees more effectively. How best to integrate the new generation with preceding generations?